Since the butterfly season will be starting up again soon I’ve been having a look back at my butterfly shots from previous years to see what gaps there are in my collection to help me plan my priorities for this year. In the process I also picked a shot for this week’s Photo of the Week, one from last year that I’m immensely fond of. This shot is of the Peacock Butterfly (Inachis io), the most colorful and spectacular species we have in Ireland. I got quite a few shots of this species throughout the year, and in previous years (including Photo of the Week 32), but I particularly like this one because of where the butterfly chose to land. To get a nice out of focus background you do need there to be a bit of a distance between your subject and the background, and you need the background to be fairly even. 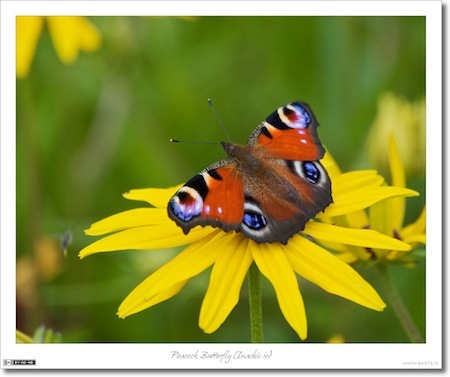 In this case the butterfly landed on a very tall and beautiful special of Daisy called Black0eyed Susan. Because the Black-eyed Susans are tall, the leaves of the other plants in the garden were a long way below, hence the lovely soft green bokeh. The lovely yellow flowers themselves also add a lot to the shot, and the red of the butterfly contrasts nicely with both the green and the yellow really making it stand out. Bart – this is one of my favorite photos you’ve taken – the vivid colors are astounding, especially like the contrast between the orange/black of the butterfly and the bright yellow of the flower.